I cordially congratulate You on the commemoration day of Your heavenly patron – the holy Apostle Bartholomew. When You were taking Your monastic vows, the Lord has foreseen Your future ministry at the See of Constantinople and vouchsafed You to receive the name of this witness and servant of the Word, Christ’s close friend (sessional hymn at Matins on June 11), who zealously preached the Gospel in Asia Minor. Being inspired by the deeds of Your predecessors who have adorned the Universal Church by the abundance of their virtues, You have been zealously doing Your apostolic work in God’s vineyard for a quarter of a century, using different gifts of the Spirit for the good of the Church, glorifying the Chief Shepherd Jesus Christ and overseeing Christ’s flock keeping it safe from savage wolves. 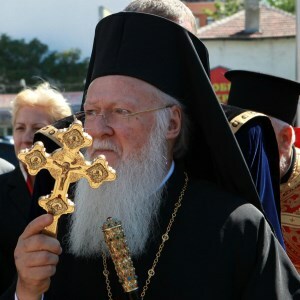 While prayerfully sharing the joy of today’s celebration with the Holy Church of Constantinople, I send You His Grace Bishop Antony of Bogorodsk as representative of the Russian Church. May the All-Bountiful God, through the intercession of Your heavenly patron, the holy Apostle Bartholomew, bestow upon You good health, peace of the soul, and His abundant aid for many good years of Your primatial ministry.